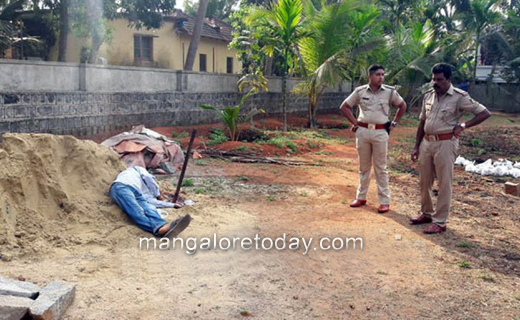 Udupi, Feb 11, 2018: A labourer from North Karnataka was found murdered on a heap of sand at Vidyanagara near Katapady on February 11, Sunday. It is believed that the man whose identity is yet to be ascertained was killed on Saturday night. A hoe which was reportedly used to eliminate him as well as a pack of curds was found nearby. Police rushed to the spot after they were informed by the locals and the body has been shifted to the hospital for post-mortem. Efforts are on to establish the identity of the dead man by contacting workers of north Karnataka origin who reside in the town.